I wasn't about to go near her house because I didn't want to be bombed by rotten apples. I didn't understand what made her so mean until Bobby Jo told me she had a son that use to be bullied until he finally took his own life. She is bitter toward kids because of it. Can't say that I blame her. 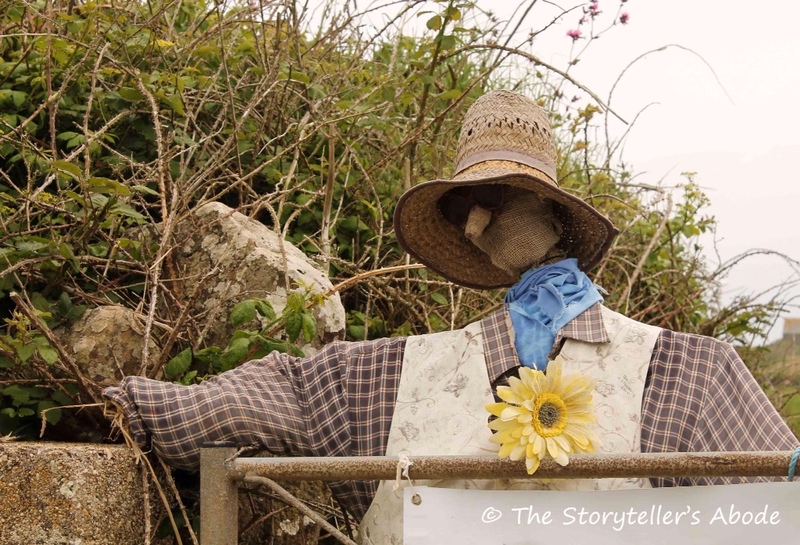 I would put up a scarecrow too. This is my 100 word submission for the flash fiction challenge, Flash Fiction for Aspiring Writers. We are given a photo prompt each week along with approximately 100-175 words with which we build our stories. It is fun and addicting and everyone is invited to participate. For more information, click HERE. Ah, thank you so much Lynn! Yes, it is very very sad! You never know what the past is and how it effects people! That is the absolute truth, Lynn! Our pasts have a lot to do with how we are today and everyone has a past, we just never know what that past is. yes so true! love the story! Such a sad take PJ. Poor lady, you can really see how the children could make her angry after living through her son’s suicide. After all, it was children who bullied her son. It’s a sad reality, many kids at different ages, choose this out, instead of trying to get help. And kids no matter who they are, all take place in some kind of bullying. Hopefully, we can educate kids enough to a point where this is rare. But I have a feeling, as long as there as kids who don’t quite fit someone else’s view of cool or ‘good enough,’ they’ll be bullies, for me know as adults their are bullies too. You’re right Mandi. There are bullies in this world – sadly, and if there are kids (adults too) that don’t fit in, they will be bullied. Like you said, with education, possibly we can make this happen less and less. Too many kids choose suicide as a solution to the problems they are having but they don’t realize that suicide is a permanent solution to a temporary problem. I agree PJ. What u say is exactly right. And what you said is true. That’s where I got what I said, from what you said. LOL! Very sad. I hope one day she’ll be able to learn to cope with her grief. Well written. Thank you so much Jenn. I hope so too! It would have to be a very terrible thing to experience. I hope I never find out. AWw that is sad! I hate bullying!! Good story. Thank you JR! I hate bullying too! People cope with grief in different ways. I can’t say that I blame her for disliking kids. Shes coping with her heartache the best way she can. A mother should never have to bury a son. A very sad but too often true tale. Well written and expressed, PJ. Thank you so much Isadora! That is true. A mother should never have to bury her child. She is the way she is because of what her son went through and because he commit suicide. You’re right! A sad story, PJ. No mother should have to bury her child, especially not because they’ve committed suicide due to bullying. Hopefully she’ll eventually recognise that not every child is at fault and she won’t be so indiscriminately mean. Thank you Louise! That’s very true! It isn’t every child that bully’s other children, so you are exactly right. Thank you Izzy! I tried to comment back to you about your story. You didn’t need to rewrite it, just add a little more to help explain. It was no big deal. It was a great story just needed a little clarification (to me). Oh, sorry! I got on the subject of your story… Thank you so much for the kind comment about my story. That’s right, we have to be careful about judging others because we never know what they have been through – or what their past was like. Thank you! I’m participating in this week’s challenge! So woot woot (lol). Thank you Maria! You are exactly right! It would be torture for her. Bullying and war– if only we could end these..
Maria, wouldn’t that be wonderful!!?? I agree with you Maria! Great interpretation, PJ, love it! That’s very sad, more so because it happens in real life too. Yes, that is true, Ali. That makes it that much sadder. Thank you for reading! Old Lady Malone feels pretty real to me. Great job Priceless. In so few words you captured some intense heart ache. Very true Colleen! She can be very real as this happens in real life. I wanted to draw attention to how devastating bullying is, to the ones that are bullied and to their loved ones. You did a fantastic job of it Priceless. Thank you so much, Colleen! I appreciate that! I wish parents of kids who are bullies would realize how hurtful and as was in this case, fatal, their actions and words can be. There should be zero tolerance for bullies, be they kids or adults. Great story. I complete agree with you S. There should be zero tolerance for bullying. Thank you for your wonderful comment! bitterness and sadness does that to a person. PJ in 100 words you say so much between the lines, i felt her sorrow and anger, wonderful writing! Yes, I agree Gina. Thank you so much for reading and for your comment! Powerful emotion and sudden twist you made dear, PJ, in just 100 words! Thank you so much, Rosey! Yes, she has been through a lot and shouldn’t be harshly judged over her actions. It is a sad story. Thank you!! I agree Rosey. But hopefully, we will do all we can to heal and move forward in a positive way rather than let the negative emotions rule our lives as she is doing. Thank you so much for your wonderful comments! that is true. moving on is hard especially for a mother who lost her child. you are welcome! 🙂 ❤ it is my pleasure! Yes, I can imagine that it is very very hard. Like you said earlier, you can’t blame her for how she feels regarding children because of how they treated her son. She’s angry, bitter, hurting, and vengeful. I didn’t mean to get all philosophical on you! LOL! Oh the obstacles we construct, and the possibility of love we lose. This is a perfect example of “until you’ve walked a mile in their shoes”. How sad, she’s needs someone to stop by and be a friend. Too bad the kids couldn’t offer to mow her lawn or something helpful…that would be a nice twist to the story. This story definitely generates a lot of feelings PJ…well done!! That is true, Deb. “Until you have walked a mile in their shoes.” Yes, it does stir up a lot of feelings. It is very sad. I always try to keep that in mind when others seem sour, I don’t know why they are so don’t judge. I understand what you mean. I try not to judge too but it isn’t always easy. We all have things in our pasts that affect us in some way or another. That’s exactly right, Deb! We don’t have to let it define us and that truly is good news! There are many things that can mentally scar a person in life and it is so difficult to overcome the damage.This story rings so true to things that happen in life and it is so important to get help and understanding from others. It is such a tragic thing for someone to be driven to taking their life when pushed too far. It is understandable why she would be so against children since her child was a victim of bullying. Hopefully, she can get some help in dealing the tragic death of her son. This type of thing is so incredibly sad. Great job on this, Joy. You are so right about that Jessie! There are many things that can scar a person that is so difficult to get over. It is tragic for someone to be pushed so far they feel they have to end their life. Thank you for your wonderful comment! So sad that old lady Malone lost her son that way. No wonder she was bitter and couldn’t bear to look at kids. Bullying is such a terrible thing, especially when it continues unchecked for any time. The poor lady will live with this loss for the rest of her life. Nicely told, PJ. You’re so right Millie! Bullying is terrible and especially when it goes unchecked. It’s very devastating to the person being bullied. She is very traumatized over the death of her son. Thank you so much for your lovely comment! I think this lady lived in my neighborhood! Great post ! LOL! I’m sorry for your neighborhood! Hopefully, her meanness wasn’t caused by her child committing suicide. That’s too bad! Sorry to hear that. LOL I just meant it to be sort of funny…I loved your piece!fact and fiction are never too far apart! Well, it was funny except for the kids that live on that block! LOL!! You’re right – fact and fiction are not too far apart! This reminds us not to be judgemental. I cannot comment if she is right or wrong but certainly she needs help. She certainly does need help! Thank you so much for commenting! oooooooooh very creepy. Great piece! Poor sad lady. She must be terribly unhappy. Some don’t know the amount of harm they bring on others by their bullying. Oh, Jacqueline! That is so true! Bullying does so much harm to those who are being bullied and often extends out to their loved ones too. It really is a sad reality. There is a lot to say about bullying. It is devastating to those who are being bullied and those who love them. Thank you so much! Flash fiction is fun to do. 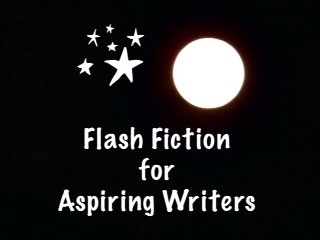 You should join the flash fiction challenge, Flash Fiction for Aspiring Writers. We are given a challenge each week (a photo prompt) and have anywhere from 75 – 175 words with which we write our stories. Everyone is invited to participate. That’s wonderful! I’m sure you will have fun. When you have written your story, link it up to the InLinkz Story Board through the blue froggy button on the challenge post. If you need instructions, please let me know. thanks! I’ve just put the pingback in the article but I have no idea how to use linked in! Did you link it up okay? That’s great! Since I haven’t seen your linkup come in yet, I went ahead and sent you instructions for the link up. If you don’t need them, you can go ahead and delete them. Thank you so much! Ah, I see what I did- I entered for an old FFW comp (it’s a lot later in the UK than America, so it serves me right for being up so late.) Anyway, I got a good story out of it so oh well (check it out if you want!). Will be interested in entering this weeks one and future ones. Thanks for taking time out!